Not to be confused with Curt Vile, Kurt Vile, or Kurt Weil. Weill was born on March 2, 1900, the third of four children to Albert Weill (1867–1950) and Emma Weill (née Ackermann; 1872–1955). He grew up in a religious Jewish family in the "Sandvorstadt", the Jewish quarter in Dessau in Saxony, where his father was a cantor. At the age of twelve, Weill started taking piano lessons and made his first attempts at writing music; his earliest preserved composition was written in 1913 and is titled Mi Addir. Jewish Wedding Song. In 1915, Weill started taking private lessons with Albert Bing, Kapellmeister at the "Herzogliches Hoftheater zu Dessau", who taught him piano, composition, music theory, and conducting. Weill performed publicly on piano for the first time in 1915, both as an accompanist and soloist. The following years he composed numerous Lieder to the lyrics of poets such as Joseph von Eichendorff, Arno Holz, and Anna Ritter, as well as a cycle of five songs titled Ofrahs Lieder to a German translation of a text by Yehuda Halevi. Weill graduated with an Abitur from the Oberrealschule of Dessau in 1918, and enrolled at the Berliner Hochschule für Musik at the age of 18, where he studied composition with Engelbert Humperdinck, conducting with Rudolf Krasselt, and counterpoint with Friedrich E. Koch, and also attended philosophy lectures by Max Dessoir and Ernst Cassirer. The same year, he wrote his first string quartet (in B minor). Weill's family experienced financial hardship in the aftermath of World War I, and in July 1919, Weill abandoned his studies and returned to Dessau, where he was employed as a répétiteur at the Friedrich-Theater under the direction of the new Kapellmeister, Hans Knappertsbusch. During this time, he composed an orchestral suite in E-flat major, a symphonic poem of Rainer Maria Rilke's The Lay of the Love and Death of Cornet Christopher Rilke as well as Schilflieder, a cycle of five songs to poems by Nikolaus Lenau. In December 1919, through the help of Humperdinck, Weill was appointed as Kapellmeister at the newly founded Stadttheater in Lüdenscheid, where he directed opera, operetta, and singspiel for five months, and also composed a cello sonata and Ninon de Lenclos, a now lost one-act operatic adaptation of a play by Ernst Hardt. From May to September 1920, Weill spent a couple of months in Leipzig, where his father had become the new director of a Jewish orphanage. Before he returned to Berlin, in September 1920, he composed Sulamith, a choral fantasy for soprano, female choir, and orchestra. Back in Berlin, Weill had an interview with Ferruccio Busoni in December 1920. After examining some of Weill's compositions, Busoni accepted him as one of five master students in composition at the Preußische Akademie der Künste in Berlin. From January 1921 to December 1923, Weill studied music composition with him and also counterpoint with Philipp Jarnach in Berlin. During his first year he composed his first symphony, Sinfonie in einem Satz, as well as the lieder Die Bekehrte (Goethe) and two Rilkelieder for voice and piano. To support his family in Leipzig, he also worked as a pianist in a Bierkeller tavern. In 1922, Weill joined the November Group's music faction. That year he composed a psalm, a divertimento for orchestra, and Sinfonia Sacra: Fantasia, Passacaglia, and Hymnus for Orchestra. On November 18, 1922, his children's pantomime Die Zaubernacht (The Magic Night) premiered at the Theater am Kurfürstendamm; it was the first public performance of any of Weill's works in the field of musical theatre. Out of financial need, Weill taught music theory and composition to private students from 1923 to 1925. Among his students were Claudio Arrau, Maurice Abravanel, Heinz Jolles (later known as Henry Jolles), and Nikos Skalkottas. Arrau, Abravenel, and Jolles remained members of Weill's circle of friends thereafter, and Jolles's sole surviving composition predating the rise of the Nazi regime in 1933 is a fragment of a work for four pianos he and Weill wrote jointly. Weill's compositions during his last year of studies included Quodlibet, an orchestral suite version of Die Zaubernacht, Frauentanz, seven medieval poems for soprano, flute, viola, clarinet, French horn, and bassoon, and Recordare for choir and children's choir to words from the Book of Lamentations. Further premieres that year included a performance of his Divertimento for Orchestra by the Berlin Philharmonic under the direction of Heinz Unger on April 10, 1923, and the Hindemith-Amar Quartet's rendering of Weill's String Quartet, Op. 8, on June 24, 1923. In December 1923, Weill finished his studies with Busoni. In 1922 he joined the Novembergruppe, a group of leftist Berlin artists that included Hanns Eisler and Stefan Wolpe. In February 1924 the conductor Fritz Busch introduced him to the dramatist Georg Kaiser, with whom Weill would have a long-lasting creative partnership resulting in several one-act operas. At Kaiser's house in Grünheide, Weill first met singer/actress Lotte Lenya in the summer of 1924. The couple were married twice: in 1926 and again in 1937 (following their divorce in 1933). She took great care to support Weill's work, and after his death she took it upon herself to increase awareness of his music, forming the Kurt Weill Foundation. From November 1924 to May 1929, Weill wrote hundreds of reviews for the influential and comprehensive radio program guide Der deutsche Rundfunk. Hans Siebert von Heister had already worked with Weill in the November Group, and offered Weill the job shortly after becoming editor-in-chief. Although he had some success with his first mature non-stage works (such as the String Quartet, Op. 8, or the Concerto for Violin and Wind Orchestra, Op. 12), which were influenced by Gustav Mahler, Arnold Schoenberg and Igor Stravinsky, Weill tended more and more to vocal music and musical theatre. His musical theatre work and his songs were extremely popular with the wider public in Germany at the end of the 1920s and the beginning of the 1930s. Weill's music was admired by composers such as Alban Berg, Alexander von Zemlinsky, Darius Milhaud and Stravinsky, but it was also criticised by others: by Schoenberg, who later revised his opinion, and by Anton Webern. His best-known work is The Threepenny Opera (1928), a reworking of John Gay's The Beggar's Opera written in collaboration with Bertolt Brecht. Engel directed the original production of The Threepenny Opera in 1928. It contains Weill's most famous song, "Mack the Knife" ("Die Moritat von Mackie Messer"). The stage success was filmed by G. W. Pabst in two language versions: Die 3-Groschen-Oper and L'opéra de quat' sous. Weill and Brecht tried to stop the film adaptation through a well publicised lawsuit—which Weill won and Brecht lost. Weill's working association with Brecht, although successful, came to an end over politics in 1930. Though Weill associated with socialism, after Brecht tried to push the play even further into a left wing direction, Weill commented, according to his wife Lotte Lenya, that he was unable to "set the communist party manifesto to music." Weill fled Nazi Germany in March 1933. A prominent and popular Jewish composer, Weill was officially denounced for his populist views and sympathies, and became a target of the Nazi authorities, who criticized and interfered with performances of his later stage works, such as Rise and Fall of the City of Mahagonny (Aufstieg und Fall der Stadt Mahagonny, 1930), Die Bürgschaft (1932), and Der Silbersee (1933). With no option but to leave Germany, he went first to Paris, where he worked once more with Brecht (after a project with Jean Cocteau failed) on the ballet The Seven Deadly Sins. On April 13, 1933 his musical The Threepenny Opera was given its premiere on Broadway, but closed after 13 performances to mixed reviews. In 1934 he completed his Symphony No. 2, his last purely orchestral work, conducted in Amsterdam and New York by Bruno Walter, and also the music for Jacques Deval's play, Marie Galante [fr]. A production of his operetta Der Kuhhandel (A Kingdom for a Cow) took him to London in 1935, and later that year he went to the United States in connection with The Eternal Road, a "Biblical Drama" by Franz Werfel that had been commissioned by members of New York's Jewish community and was premiered in 1937 at the Manhattan Opera House, running for 153 performances. He and his wife moved to New York City on September 10, 1935, living first at the St. Moritz Hotel before moving on to an apartment at 231 East 62nd Street between Third and Second Avenues. Weill and his wife rented an old house with Paul Green during the summer of 1936 near Pine Brook Country Club in Nichols, Connecticut, the summer home of the Group Theatre, while finishing Johnny Johnson. Some of the other artists who summered there in 1936 were; Elia Kazan, Harry Morgan, John Garfield, Lee J. Cobb, Will Geer, Clifford Odets, Howard Da Silva and Irwin Shaw. Rather than continue to write in the same style that had characterized his European compositions, Weill made a study of American popular and stage music. His American output contains individual songs and entire shows that not only became highly respected and admired, but have been seen as seminal works in the development of the American musical. In 1939 he wrote the music for Railroads on Parade, a musical spectacular put on at the 1939 World's Fair in New York to celebrate the American railroad industry (book by Edward Hungerford). Unique among Broadway composers of the time, Weill insisted on writing his own orchestrations (with some very few exceptions, such as the dance music in Street Scene). He worked with writers such as Maxwell Anderson and Ira Gershwin, and wrote a film score for Fritz Lang (You and Me, 1938). Weill himself strove to find a new way of creating an American opera that would be both commercially and artistically successful. The most interesting attempt in this direction is Street Scene, based on a play by Elmer Rice, with lyrics by Langston Hughes. For his work on Street Scene Weill was awarded the inaugural Tony Award for Best Original Score. In the 1940s Weill lived in Downstate New York near the New Jersey border and made frequent trips both to New York City and to Hollywood for his work for theatre and film. Weill was active in political movements encouraging American entry into World War II, and after America joined the war in 1941, Weill enthusiastically collaborated in numerous artistic projects supporting the war effort both abroad and on the home front. He and Maxwell Anderson also joined the volunteer civil service by working as air raid wardens on High Tor Mountain between their homes in New City, New York and Haverstraw, New York in Rockland County. Weill became a naturalized citizen of the United States in 1943. Weill had ideals of writing music that served a socially useful purpose. In the US, he wrote Down in the Valley, an opera including the song of the same name and other American folk songs. He also wrote a number of songs in support of the American war effort, including the satirical "Schickelgruber" (with lyrics by Howard Dietz), "Buddy on the Nightshift" (with Oscar Hammerstein) and – with Brecht again as in his earlier career – the "Ballad of the Nazi Soldier's Wife" ("Und was bekam des Soldaten Weib?"). Intended for broadcast to Germany, the song chronicled the progress of the Nazi war machine through the gifts sent to the proud wife at home by her man at the front: furs from Oslo, a silk dress from Paris etc., until finally, from Russia, she receives her widow's veil. Apart from "Mack the Knife" and "Pirate Jenny" from The Threepenny Opera, his most famous songs include "Alabama Song" (from Mahagonny), "Surabaya Johnny" (from Happy End), "Speak Low" (from One Touch of Venus), "Lost in the Stars" (from the musical of that name), "My Ship" (from Lady in the Dark), and "September Song" (from Knickerbocker Holiday). Go forward into dark again. Sixty years after his death, Weill's music continues to be performed both in popular and classical contexts. In Weill's lifetime, his work was most associated with the voice of his wife, Lotte Lenya, but shortly after his death "Mack the Knife" was established by Louis Armstrong and Bobby Darin as a jazz standard. His music has since been recorded by many performers, ranging from Nina Simone, Judy Garland, Frank Sinatra, The Doors, Ella Fitzgerald, David Bowie, Robbie Williams, Judy Collins, John Zorn, Dagmar Krause, Steeleye Span, The Young Gods and PJ Harvey to New York's Metropolitan Opera and the Vienna Radio Symphony Orchestra. Singers as varied as Teresa Stratas, Ute Lemper, Gisela May, Anne Sofie von Otter, Max Raabe, Heinz Karl Gruber, Dee Dee Bridgewater and Marianne Faithfull have recorded entire albums of his music. In 1985, Hal Willner produced Lost in the Stars: The Music of Kurt Weill, a tribute album in which Weill's songs were interpreted by a variety of artists, including Todd Rundgren, Tom Waits, Lou Reed and Sting. Amanda Palmer, singer/pianist of the 'Brechtian Punk Cabaret' duo The Dresden Dolls, has Kurt Weill's name on the front of her keyboard (a pun with the name of the instrument maker Kurzweil) as a tribute to the composer. In 1991, seminal Swiss Industrial music band The Young Gods released their album of Kurt Weill songs, The Young Gods Play Kurt Weill. Weill was also often cited as an influence on Goldfrapp's Felt Mountain. In 2008, Weill's songs were performed by Canadian musicians (including Sarah Slean and Mary Margaret O'Hara) in a tribute concert as part of the first annual Canwest Cabaret Festival in Toronto. In 2009 Duke Special released an EP, Huckleberry Finn, of five songs from an unfinished musical by Kurt Weill based on the novel by Mark Twain. 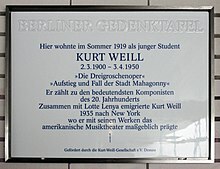 The Kurt Weil Centre (German:Kurt-Weill-Zentrum) in Dessau was founded in 1993. It provides a museum, library, archive and media centre and organises an annual festival celebrating the composer's work. It is housed in the Feininger house, a house designed by the architect Walter Gropius which was originally lived in by the artist Lyonel Feininger. The property is part of the World Heritage site the Bauhaus and its Sites in Weimar, Dessau and Bernau. The centre, with its collection of material on Weill, is listed as a cultural memorial of national importance. The centre is one of the "Beacons of light" of the Konferenz Nationaler Kultureinrichtungen (Conference of National Cultural Institutions), a union of cultural institutions in the new states of Germany i.e. area that was formerly East Germany. Kurt Weill's grandmother was Jeanette Hochstetter of Liedolsheim in Baden-Württemberg. Weill was one of four members of the same Hochstetter family to lead distinguished careers in the fields of music and literature. His first cousin once removed was Caesar Hochstetter (born January 12, 1863 in Ladenburg, a suburb of Mannheim – his date and place of death are unknown but this was probably during The Holocaust), a composer and arranger who collaborated with Max Reger and who dedicated Aquarellen, Op. 25 to him. Caesar's younger brother was Gustav Hochstetter [de] (born May 12, 1873, Mannheim – died 1942, Theresienstadt concentration camp), Professor of Literature at the University of Brussels, writer and poet and friend of Wilhelm Busch. His second cousin was the childhood prodigy pianist, Lisy Fischer (born August 22, 1900, Zürich, Switzerland – died June 6, 1999, Newcastle upon Tyne, England). The Young Gods Play Kurt Weill (Pias, April 1991), Studio recording of the songs performed live in 1989. An Evening of Kurt Weill, starring Bebe Neuwirth, Roger Rees, and Larry Marshall, was performed in New York City at Alice Tully Hall; Rees directed the production. ^ a b c Jackson, Kenneth T. (1995). The Encyclopedia of New York City. New York City: The New York Historical Society; Yale University Press. p. 1252. ISBN 0-300-05536-6. ^ a b c d "Kurt Weill Dead; Composer, Was 50" (PDF, fee required). The New York Times (New York ed.). The New York Times Company. April 4, 1950. p. 28. ISSN 0362-4331. OCLC 1645522. Retrieved March 29, 2015. ^ Hinton & Schebera, pp. 541–42. ^ Lenya, Lotte; George Davis (Spring 1997). "Weill and His Collaborators" (PDF). Kurt Weill Newsletter. Kurt Weill Foundation for Music. 15 (1): 4–9. ISSN 0899-6407. Retrieved October 24, 2010. ^ "Music and the Holocaust", holocaustmusic.ort.org; retrieved August 22, 2011. ^ Kurt Weill Archived December 5, 2013, at the Wayback Machine. Spartacus-Educational.com (April 3, 1950). Retrieved on August 22, 2011. ^ Profile Archived August 9, 2013, at the Wayback Machine, ata-divisions.org; accessed June 6, 2014. ^ a b c Mercado, Mario R. Kurt Weill: A Guide To His Works, The Kurt Weill Foundation for Music, 1989. ^ Pinewood Lake website retrieved on September 10, 2010 Archived July 27, 2011, at the Wayback Machine. Pinewoodlake.org (May 20, 2009). Retrieved on August 22, 2011. ^ "The Boys That Make the Noise", Music section, Time (magazine), July 5, 1943. ^ Tony Award for Best Original Score. Broadwayworld.com. Retrieved on August 22, 2011. ^ Viglione, Joe (February 9, 2010). "Lost in the Stars". allmusic.com. Retrieved May 2, 2012. ^ "Theater Hall of Fame members". Retrieved February 7, 2019. ^ Kurt Weill – A Life in Pictures and Documents. Thames & Hudson. 2000. pp. Family Tree, p. 3. ISBN 0-500-97487-X. ^ Barone, Josua (November 6, 2017). "Hear a Newly Found Kurt Weill Song That Surprised Experts". The New York Times. Retrieved November 8, 2017. ^ The introduction by Kim H. Kowalke in the published score (European American Music Corporation EA 584) gives the background and chronology for the songs. David Drew. Kurt Weill: A Handbook (Berkeley, Los Angeles, University of California Press, 1987). ISBN 0-520-05839-9. Stephen Hinton. "Weill's Musical Theater: Stages of Reform" (University of California Press, 2012) ISBN 978-0520271777. Kim H. Kowalke. A New Orpheus: Essays on Kurt Weill (New Haven, Yale University Press, 1986). ISBN 0-300-03514-4. Ronald Sanders. The Days Grow Short: The Life and Music of Kurt Weill (New York, Holt, Rinehart and Winston, 1980). ISBN 0-03-019411-3. 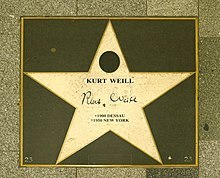 Wikimedia Commons has media related to Kurt Weill. The OREL Foundation – Kurt Weill's biography and links to bibliography, discography and media.